Stephan Martiniere is a multi-international award winning artist. In 2012 Martiniere was voted one of the 50 Most Inspirational Artists by Imagine FX Magazine. His body of work has come to be recognized by artists and designers across the globe. His work not only holds an astounding uniqueness of vision, but he has set the bar for digital painting as a whole. In contrast to the dark chaotic post-apocalyptic interpretations of the future so often depicted in the contemporary art world, Martiniere’s beautifully rendered paintings transcend traditional descriptions and bring a wondrous new vision to alternative worlds and futures with a stunning sense of scope, scale and detail. His immense landscapes demonstrate a unique painterly approach to the use of digital tools creating a visual richness that is both emotionally seductive and textually elaborate. Clearly drawing much of his inspiration from his background in classical arts and architecture, Martiniere’s “brilliantly structured, incredibly detailed, and awe inspiring, neo-classical landscapes defines a fresh visionary signature that is his alone.” (Lorne Manning, creator of Oddworld). A graduate of a prestigious art school in Paris, Martiniere’s thirty year career is impressive in its scope. His early career ranged from conceptual design work for everything from theme parks, television and animation. For the last fifteen years Martiniere has focused on digital paintings for book covers, digital art and concept art for major motion pictures, as well as artistic design and direction for computer games. His clients include ILM, Disney, Universal, Paramount, Warner Brothers, 20th Century Fox and DreamWorks. 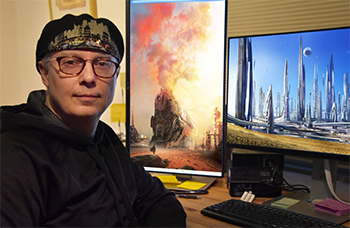 Stephan Martiniere has worked on movies such as The Suicide Squad, Independence Day: Resurgence, Tomorrowland, Avengers: Age of Ultron, Guardians of the Galaxy, 300: Rise of an Empire, Total Recall, I, Robot, Tron: Legacy, Star Wars Episodes 2 and 3, Star Trek, Knowing, Virus, Red Planet, The Time Machine, The Fifth Element, the upcoming Ready Player One, Alita: Battle Angel, and Aquaman. Martiniere has produced over a hundred and fifty book covers and numerous comic book covers and editorial illustrations for such clients as The National Geographic, Popular Science, Tor Books, Pyr, Penguin, Random House, Dark Horse, and Radical Comics. Martiniere has also worked extensively with Disney Imagineering on Disneyland parks and expansions across the globe doing visual development for The Pirates of the Caribbean’s,Avatar, and StarWars. Martiniere has authored four art books titled Quantum Dreams, Quantumscapes, Velocity, and Trajectory.